By integrating Trustpilot with Nosto, you're able to recommend products that are best ranked in terms of ratings and reviews, and also show rating and review count in your Onsite Product Recommendations Showing ratings will build trust towards your store and improve the credibility of your products. Adding ratings and reviews also power up your recommendations by helping you to sell more and make most out of both Nosto and Trustpilot together. Setting up the integration takes only a few seconds and couple of seconds, and you only need your Trustpilot Business Unit ID and credentials to your Trustpilot admin. 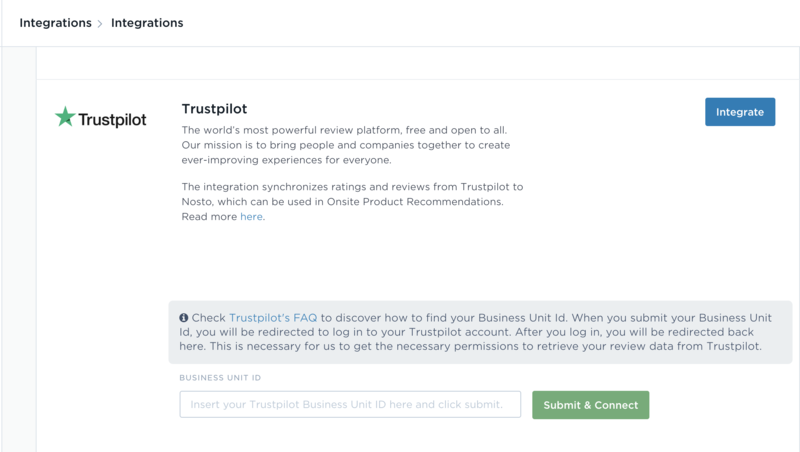 Navigate to Integration area in the Nosto admin panel and expand Trustpilot. Insert the business ID to the selected field and click submit&connect. This will send you to Trustpilot admin and prompt you to log-in, which will connect Nosto to your Trustpilot account. Integration is one way -only, and only has read-access to your Trustpilot account. Integration synchronises only ratings and review data, meaning that no personal data like reviewer's name or alias is processed or stored in Nosto's system. Once connected, it will take up to a few hours for Nosto to process the data, all depending how many products you have in your inventory. Once finished, a success message such as below is shown indicating how many products have the property for ratings and reviews. Alternatively a debug-log is shown in case of a possible integration error. Once ratings and review data is stored in Nosto, web-developers can add rating and reviews to Onsite Product Recommendations by using the regular template variables or by as simply as enabling the reviews in case default design templates are used. Trustpilot ratings and reviews are typically set at an SKU / product-variant level, whereas Nosto's default integration makes use of the main product, while SKU / variant-details are optional for Nosto. In case your products don't have variants like colour, size or volume, you can ignore this troubleshooting guide. In order for Nosto to match the data from Trustpilot, products mapped in the integration between your site and Nosto need to include the SKU / variant-detail. 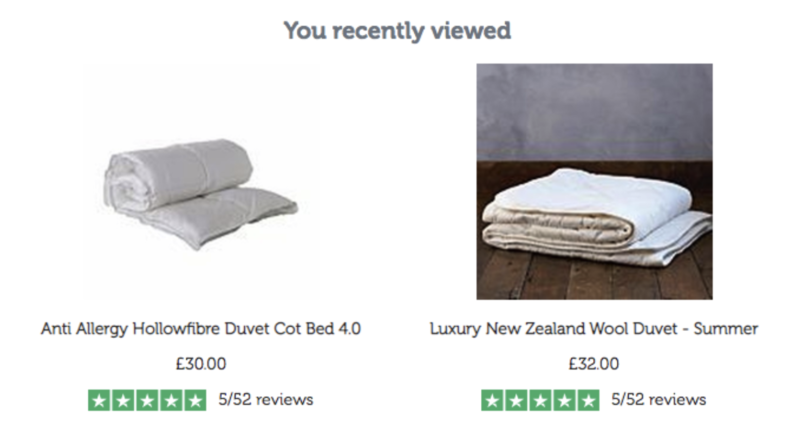 After processing the review data from Trustpilot an error log will indicate if Nosto is unable to match ratings and reviews due to missing SKU / product-variant detail. Latter two steps are not necessary required, but this will dramatically speed up the process and allow you to use ratings and reviews faster as Nosto synchronises all products and details at once during the re-connection, instead of when product details change in your shop e-commerce platform. Mapping the variant-detail to Nosto depends on your shop's e-commerce platform and the plug-in or module version you use. Easiest way to include the product attribute is to update to the latest version regardless of the platform. Magento: Support from version Nosto module version 3.0.0 and above. Read configuration guide. Magento 2: Support from Nosto module version 2.3.6 and above. Read configuration guide. Prestashop: Support from Nosto module version 3.0.0 and above. Read configuration guide. Shopware: Support from Nosto module version 2.1 and above. Enabled by default without additional configuration, guide for troubleshooting. Other platforms: Read integration guide here.